For those D-6, D-5, D-2, and Super Chromega E Dichroic users who have the Micromega Dual Range Focus attachment, we have a special Flexible Focus Shaft Extension Kit to fit the fine focus control. 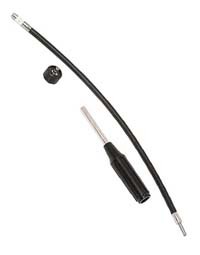 The three piece kit consists of a 20" flex shaft, 8" handle, and an adapter/focus knob. The adapter knob replaces the original fine focus knob. The flexible shaft then simply snaps onto the the quick-connect post on the adapter knob. 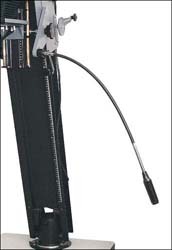 The flexible shaft can be connected or removed instantly as required. Overall length of the assembled extension shaft is 28". For situations where even greater length is required, an optional 18" extension is available to fit between the handle and flex shaft. The adapter knob supplied with this kit will fit only the Micromega Dual Range Focus accessory for Omega D-5, D-6, D-2, and Super Chromega E Dichroic enlargers. Additional knobs are available to allow one extension to be shared between multiple enlargers.